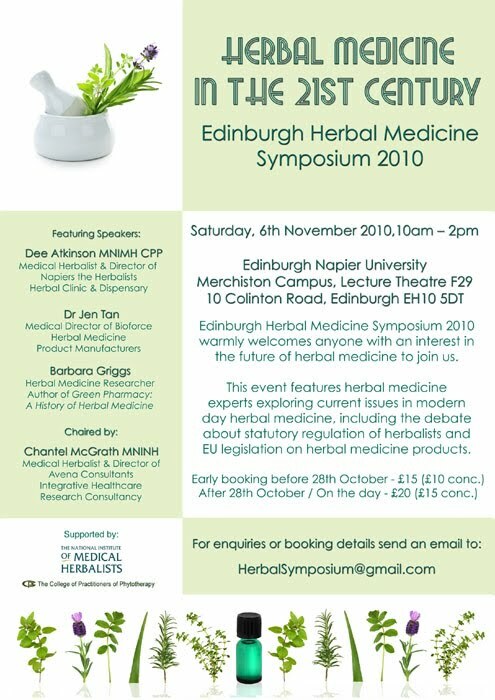 Following on from recent news of the closing down of the herbal medicine training institutions in Scotland, new EU legislation on herbal medicinal products coming into force in 2011, and the recent campaigns for statutory regulation of herbalists, the organisers of this event felt that they wanted to create an arena for dialogue to explore any queries, confusion or concerns surrounding these issues and the future of herbal medicine in the 21st century. These issues affect not only herbalists, but anyone with an interest in or profession related to natural, integrative, and complementary health care. As such, this event is open to any with an interest in the future of herbal medicine, such as students, medical herbalists, health care professionals, doctors, nurses, and complementary therapists. The objective of this symposium is to inspire people about the future of herbal medicine, address concerns about upcoming THMPD legislation, exploring current issues of the future of herbal medicine and promoting communication about herbal medicine and its integration within the health care communities. Expert herbal medicine speakers will represent a broad spectrum of the herbal industry, including a local scottish herbal medicine clinic and dispensary, herbal medicines manufacturer and supplier, a herbal medicine research consultancy, and a distinguished author and historian of herbal medicine, past and present. There will be time for questions and answers with the experts, and a discussion panel at the end. A certificate of attendance for CPD is available on request when booking. You are welcome to forward this invitation to any individuals or organisations who may be interested in this event. Please also see the event poster below. This may be printed out and displayed in a suitable place if you wish. High resolution copies for A3 & A4 posters can be emailed to you for printing on request. For any further enquiries, do not hesitate to get in touch. To book a place, please request a booking form by email or click on the link above.